The latest cover of our member magazine, Tropical Dispatch, was created by Olivia Marie Braida-Chiusano, founder of the Academy of Botanical Art at Selby Gardens. This piece is currently on display in the Payne Mansion as part of our exhibit, Selby’s Secret Garden. Ms. Braida – a nationally-recognized artist whose works can be found in many private and public collections – has masterfully demonstrated the contents of a Brazilian bromeliad of the genus Neoregelia. The drawing showcases the unique shape of the plant that allows it to catch rainwater, providing a unique habitat for many and varied organisms. 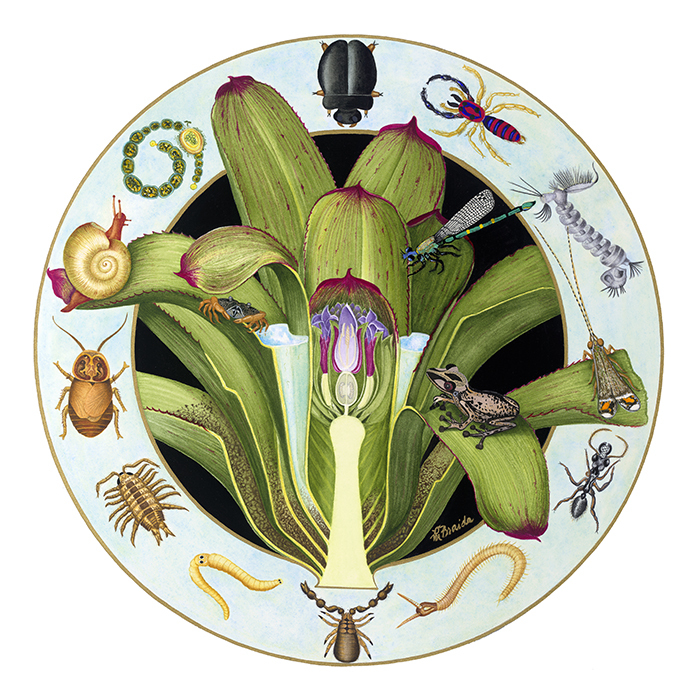 Through her masterful work, Ms. Braida depicts the secret life that dwells within these plants.